first flight 19.10.1964; MAP to Italy delivery date 23.2.1965 (the only one delivered in bare metal livery); 20°Gruppo 26.2.1965 (Nato camouflage scheme); 20-1 4.5.1976-9.8.1984; IRAN 31.5.1967-2.8.1968; IRAN 8.1.1971-3.8.1971; IRAN 18.12.1973-4.9.1974; IRAN 28.7.1977-30.4.1979; IRAN 8.9.1982-26.7.1983; stored Grosseto 10.1985; 4-23 3.5.1985-5.5.1993; IRAN 1.2.1988-18.5.1989; IRAN 5.5.1993-14.4.1997; respray in grey camouflafe scheme; delivery date 20°Gruppo 14.4.1997, 4-23 10.8.1997-20.6.1998; converted TF-104G-M 11.2.1997-11.4.2000 by 4°RMV; 4-23 26.9.1999-25.2.2003; last flight 17.4.2003 to Grazzanise, withdrawn from use 01.7.2003; storage Grazzanise AB CFE area July 2006 last noted; 4-23 was carrying Squadron Leader Insignia. "20-1" "Istituto di Scienze Militari Aeronautiche" (ISMA) of Florence (Institute of Aviation & Military Science) as Gate Guardian, via del Aeronautica 14, Florence, Italy; TF-104G coded 20-1 in first period NATO camouflage (with large white codes) with the 20 Squadron insignia on the tail, July 7, 2008 first noted; October 2009 noted; April 2018 noted. 20-2 8.1972-5.1975; 20-2 crashed May 20, 1975 near Marina de Grosseto due to a mechanical failure (Forward Flap Actuator Failure), both crew member ejected safely; Col Benedetto Chianese and Capt Cesare Balducci. 4-25 damaged in belly-landing on May 21.1987, Capt Paolo Sfarra and Capt Paolo Medda were ok, not repaired; to Alenia and stored, used for spare parts; withdrawn from use at Alenia and used for static exhibition; Cervia AB for CFE in 2002; on display coded "UTT2-01" (2nd Ufficio Tecnico Territoriale Aeromobili) at Turin-Casselle AP in July 2003; February 2008 noted; March 5, 2011 noted; October 2014 noted; coded "4-28" August 2015 first noted; March 2018 noted. 4-28 crashed May 31, 1988 at Trapani AB, both killed, Maj Pietro Vidale (pilot) and Serg Giovanni Montagna (photographer); photo mission for “Le Aquila” movie, during squadron exchange with Luftwaffe JaboG 49. 4-27 16.7.1985-12.4.1994; 4-27 special fin flash August 1986; IRAN 22.11.1988-15.5.1990; withdrawn from use due to airframe life Grosseto 9.5.1994-21.9.2004; dump Grosseto AB without tail/engine 2004 noted; dump Grazzanise AB without tail and engine May 2007 noted; May 2017 last noted. 20-6; 20-7 10.1973; IRAN till 2.4.1975; delivery date 20°Gruppo 2.4.1975; 20-7 28.4.1976; 20-9 11.1977; 20-7 13.4.1978-09.1980; IRAN 9.8.1978-26.11.1979; damaged Grosseto 21.9.1980 during a touch and go and burned; withdrawn from use and put on pole at Grosseto AB in April 1985; “UNUS SED LEO” special colors preserved as Gate Guard at Grosseto AB in blue/yellow scheme in 20°Gruppo area 16.6.1991; 2004 last noted; near the new 20°Gruppo building close the old 4°RMV hangar in front of the new 20°Gruppo command building, and now poled from the exhaust nozzle; July 8, 2008 first noted; May 11, 2011 noted; March 2019 noted. delivery date 20°Gruppo 13.5.1965; IRAN 27.9.1968-28.7.1969; IRAN 4.2.1971-2.11.1971; delivery date 20°Gruppo 2.11.1971, 20-6 8.7.1974; IRAN 11.10.1974-26.8.1975; delivery date 20°Gruppo 26.8.1975; 20-7 19.6.1975-14.7.1975; 20-6 10.1978-18.9.1984; IRAN 30.1.1979-2.1.1980; IRAN 28.7.1983- 3.8.1984; delivery date 20°Gruppo 3.8.1984, 20-6 08.1984-18.9.1984; 20-29 05.1985; 4-29 (green camouflage scheme) 15.5.1985-01.1995; IRAN 14.6.1988-25.9.1989; IRAN 14.9.1993-25.8.1997; respray in grey camouflage scheme; delivery date 20°Gruppo 4 Stormo "Amedeo d'Aosta" Grosseto AB 25.8.1997, 4-29 08.1997-3.9.1998; converted to TF-104G-M 25.9.1999-25.1.2001 by 4°RMV; 4-29 26.9.1999-14.2.2003; withdrawn from use 2.6.2003; Grazzanise dump July 4, 2009 noted; May 2017 last noted. RS-09 1.9.2000; damaged from roof collapse December 10.2001 at Pratica di Mare with RSV 311°Gruppo; withdrawn from use 01.2002-1.10.2003; stored at Pratica di Mare AB May 2004; restored and respray in special scheme 03.2005; preserved Perdasdefogu 2.8.2005, no code; on pole at Perdasdefogu, a Sardinian firing range, near Decimomannu, tail with typical Sardinia Island flag; 09.2009 noted; July 2015 noted; the insignia under the cockpit is: PISQ (Polygon Interfere Salto di Quire) interforces firing range Salto di Quire; May 2017 last noted. crashed April 8, 1974 as 20-8 into mountain at Colle Trinità near Perugia (CFIT); both pilots were killed, 2.190 flight hours. 4-31 17.7.1985-6.12.1993; IRAN 21.9.1988-31.1.1990; withdrawn fom use Grosseto AB 23.1.1994 due to airframe life; dump Grosseto AB 2004 noted; Grazzanise dump 25.5.2007; May 2017 last noted. 20-11 crashed February 10, 1969 near Valfabbrica (PG), East of Perugia; the pilot killed. The second pilot ejected safely. During the mission the port tiptank separated from the wing and severely damaged the tail on impact. The aircraft was uncontrollable and crashed. 4-32 8.9.1985-3.9.1987; damaged on landing at Grosseto 3.9.1987; repaired by Aeritalia 30.9.1987-13.5.1988, still in service 10.1988-20.2.1996; IRAN 25.6.1990-26.3.1992; IRAN+TF-104G-M conversion 10.4.1996-23.12.1998; delivery date 20°Gruppo 23.12.1998; grey camouflage scheme; 4-32 12.2.1999-12.3.2003; withdrawn fom use Grosseto 03.2003, dump Grazzanise 1.4.2003; May 2017 last noted. 4-33 29.5.1985-5.6.1994; IRAN 16.2.1989-25.9.1990; IRAN+TF-104G-M conversion 22.9.1994-10.6.1998; delivery date 20°Gruppo 10.6.1998 in grey camouflage scheme, 4-33 5.7.1998-18.12.2001; 4°RMV 2002 last noted; withdrawn from use Grosseto AB 23.10.2003; Grazzanise AB 10.4.2005 noted; May 2017 last noted. 20-15 04.1971-07.1984; IRAN 1.8.1972-14.5.1973; IRAN 30.3.1976-24.1.1977; IRAN 27.6.1980-3.11.1981; 4-34 07.1984-16.8.1996; IRAN 20.12.1985-9.10.1986; IRAN 17.10.1990-21.10.1992; IRAN + TF-104G-M conversion 29.4.1997-9.9.1999, grey color scheme; delivery date 20°Gruppo 9.9.1999; 4-34 26.9.1999-29.10.2004; stored 26.3.2001-26.3.2003; delivery date 311°Gruppo 24.11.2004, RS-09 30.5.2005; RS-09 RSV final flight on July 27.2005; stored Pratica di Mare October 2005; conserved inside a shelter at Grazzanise June 16, 2010 last noted; N990SF STARFIGHTERS Inc, FAA registration 01.2012; January 20, 2012 first noted at KSC, Florida; September 2013 noted; in June 2014 the aircraft was still in storage awaiting conversion; in October 2015 it was seen wearing light grey primer overall, awaiting final paint; status November 2015: active, but not flown (MB certification and seat delivery pending), engine J79-11; logo: none; colors: grey primer, final scheme not decided. 20-16 20°Gruppo 04.1971-20.9.1974; IRAN till 30.10.1973; crashed September 20, 1974 near Firenze, Peretola (FI); both pilots were killed; crashed 2 NM south of Firenze/Peretola AP during an aerobatic display, it crashed 1500 m from the Peretola runway. Both pilots had no chance to escape and were killed instantly. 4-20 preserved inside the new Grosseto Base museum (old 20 Gruppo hangar) July 8, 2008 noted; mobile display September 2014 noted; March 2018 noted. manufactured by Lockheed at Palmdale, California, airlifted to Turin; reassembled and delivered to AMI; delivered AMI June 27, 1969; delivered as 20-19 in 1976; Aeritatia for repair 6.7.1976-28.4.1977; delivery date 20°Gruppo 28.4.1977; 20-20 28.7.1977-14.11.1977, 20-19 again in 05.1978-21.5.1985; IRAN 22.12.1978-28.12.1979; IRAN 7.6.1983-3.5.1984; 4-36 10.1985-13.9.1993; IRAN 28.6.1988-6.12.1989; IRAN+ TF-104G-M prototype at Alenia November 23, 1993-24.11.1997; first TF 104G converted in "M", first flight 02.1997; grey camouflage scheme, delivery date 4°Stormo 20°Gruppo Grosseto AB (LIRS) 24.11.1997; 4-36 28.3.1998-27.7.2001, last flight 02.2002, withdrawn from use Grosseto 9.3.2002; dump Grosseto AB; 2003 last noted; Grazzanise stored May 2007 noted; May 2017 last noted. 20-20 19.6.1975-25.6.1975; IRAN till 24.8.1976; delivery date 20°Gruppo 24.8.1976; 20-19 1977; 20-20 20 13.4.1978-25.7.1984; IRAN 8.2.1980-6.1.1981; IRAN 11.12.1984-27.9.1985; delivery date 20°Gruppo 27.9.1985; 4-37 10.1985-6.9.1991, IRAN 3.7.1989-12.7.1991; crashed as 4-37 20°Gruppo of 4°Stormo on September 6, 1991 crashed after encountering an engine fire at Tesorino di Valpiana, near Massa Marittima, near its home base of Grosseto, Tuscany, Maritime Alps, both pilots ejected safely with Martin-Baker seats. 4-38 1985-20.6.1995; IRAN 31.7.1987-23.12.1988; IRAN 3.11.1992-27.4.1995; gear collapsed on landing at EDNN on May 19, 1995 after hitting approach lights; crashed coded 4-38 of 20°Gruppo on June 20, 1995 into sea south of the Montechristo island in misty weather conditions, pilot was killed. 4-39 17.7.1985-04.1997; IRAN 25.8.1986-23.11.1987; IRAN 13.11.1991-24.3.1994; severely damaged during a touch and go after a precautionary landing pattern without nose gear at Grosseto on 23.4.1997, withdrawn from use and dumped 13.3.1998; dump Grazzanise 10.10.2005; May 2007 last noted; likely scrapped. 4-40 29.7.1994-8.7.1997; converted TF-104G-M 29.5.1997-19.7.1998 by 4°RMV; delivery date 20°Gruppo 19.7.1998; 4-40 17.7.1998-1.2.2000; IRAN 22.3.1999-21.12.2000; respray in grey camouflage scheme; delivery date 20°Gr 21.12.2000, 4-40 16.5.2002-21.10.2004, Pratica di Mare AB May 2004;last flight to Grazzanise 25.10.2004; withdrawn from use 26.10.2004; delivered December 2011 to the Starfighters Inc Team in Florida and got its civil FAA registration "N991SF" in January 2012; early 2014 it was painted in a light grey overall scheme with white company logos; currently being prepared for making it operational again; December 2018 noted. 20-24 2.12.1972-19.11.1979, IRAN till 30.6.1977; crashed as 20-24 of 20°Gruppo on November 19, 1979 into sea near Talamone; approaching Grosseto AB sudden loss of altitude and crashed in the Tyrrehnian sea, probably spatial disorientation in poor weather condition; both pilots were killed; 1.555 flight hours. RS-08 4.5.2005-27.7.2005; last flight 27.7.2005 with 4.276 flight hours; stored 2.8.2005-28.5.2007; Grazzanise stored May 2008; January 17, 2012 forward fuselage donated to "102 Gruppo Virtual", transported to San Giustino; display as mobile virtual simulator; June 2014 last noted. 4-4207.1985-1.9.1997; IRAN + R3 repair 9.3.1987-31.7.1992; IRAN + TF-104G-M conversion 28.7.1997-11.6.1999. grey camouflage scheme, delivery date 20°Gruppo 11.6.1999; 4-42 20°Gruppo of 4°Stormo 23.7.1999-1.2.2004, stored 1.10.2000-17.4.2002; withdrawn from use Grazzanise 29.1.2004- 10.10.2005 with 3.597 flight hours; this ex Italian Air Force Starfighter was delivered December 2011-January 2012 to the Starfighters Inc Team at Kennedy Space Center (KSC) in Florida and got its civil FAA registration "N992SF" in January 2012; early 2014 it was painted in a fragmented grey white blue overall scheme meeting specific future mission requirements. October 12, 2015 seen airworthy over Florida; January 2019 noted. 4-44 30.6.1989-01.1995; IRAN 20.1.1993-18.12.1995; grey camouflage scheme; delivery date 20°Gruppo 18.12.1995; 4-44 20.2.1996-30.4.1998; TF-104G-M modification 23.2.1998-22.10.1999 by 4°RMV; 4-44 05.1999-7.11.2000; withdrawn from use 11.2000 with 2.869 flight hours; dump Grosseto AB 06.2001; 21.9.2004 last noted; Grazzanise stored May 2007 last noted; likely scrapped. First modified TF-104G-M aircraft withdrawn from use! 4-48 09.1993-8.7.1997; IRAN + TF-104G-M conversion 21.7.1997-22.12.1999; delivery date 20°Gruppo 22.12.1999; grey camouflage scheme, 4-48 16.5.2002-31.10.2003; last flight 31.10.2003 to Grazzanise; withdrawn from use 11.11.2003 with 3.267 flight hours; Grazzanise AB CFE storage flightline on April 7, 2009 noted; stored in shelter June 2011 noted. 4-45 16.4.1991-05.1995; to Alenia for IRAN+TF- 104G-M conversion 12.4.1995-20.7.1998; grey camouflage scheme; delivery date 20°Gruppo 20.7.1998; 4-45 17.9.1998-06.2003, stored 2.11.1999-16.2.2001; withdrawn from use August 13, 2003; last flight to Grazzanise 12.8.2003 with 2.947 flight hours; CFE compound Grazzanise AB in September 2003; Grazzanise AB storage June 2010 noted. 4-47 15.4.1992-16.10.1996; stored 24.3.1997-24.6.1997; IRAN+TF-104G-M conversion 25.6.1997-22.12.1999; grey camouflage scheme; delivery date 20°Gruppo 22.12.1999, 4-47 25.1.2000-21.10.2003; last flight 9.12.2003 to Grazzanise with 3.100 flight hours, withdrawn from use Grazzanise 12.12.2003; Grazzanise AB storage 07.2008 noted; 2011 noted. ex GAF 27+89, by road transport to Cameri on August 9, 1984 (delivery date could be August 5, 1984) with 2.157 flight hours; IRAN 28.8,1984-21.9.1988; delivery date 20°Gruppo September 21, 1988. (4-43) at Bitburg AB it made a very hard landing, collapsing the landing gear, and skidded over the runway on October 19, 1988; LtCol Fabio Landi and LtCol Paolo Telesca did not eject and were safe; transported to Alenia again where it arrived December 12, 1988. It was declared damaged beyond economical repair with a total of 2.192 flying hours and put on storage at Caselle and was used for spare parts and likely an instructional and check airframe for the TF-104G-M modifications. 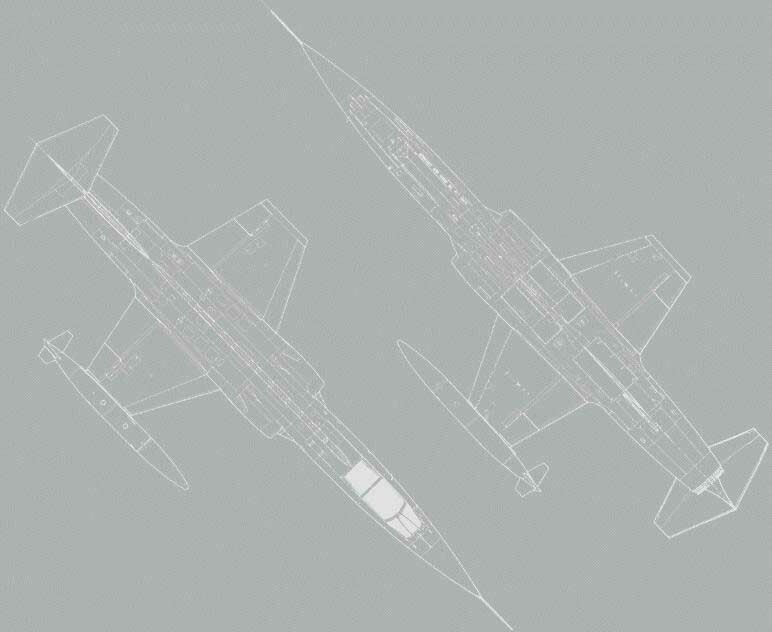 It was last noted at Caselle on September 1, 1999 just when the TF-104G-M modification development had been finished. In July 2001 the fuselage was seen at the dump of Grosseto AB and it stayed there at least until September 21, 2004. It was not seen since and probably scrapped, withdrawn from use with 2.192 flight hours. 4-46 26.6.1991-12.4.1995; IRAN + TF-104G-M conversion 30.5.1995-24.9.1998; grey camouflage scheme; delivery date 20°Gruppo 24.9.1998; 4-46 4.10.1998-22.8.2000; crashed as 4-46 (grey camouflage scheme) into the sea at Grosseto AB on August 22, 2000 after Landing Gear problems; controlled crash into the sea; main Landing Gear bay doors closed before leg retraction after a hard touch and go, Capt Marco Amort (instructor) and Lt Antonio Di Matteo (student) both ejected safely; relict in Grosseto 09.2000-12.12.2003; 2.828 flight hours; dump Grazzanise 23.2.2004 noted; 25.5.2007 last noted; likely scrapped. A total of 30 TF-104G have been acquired by the AMI. With deliveries beginning in 1965, 24 were bought as training aircraft for the F-104G and RF-104G procured in the early sixties. The first 12 were MAP aircraft built by Lockheed in the USA and those were model 583D. Another 12 had been built by Lockheed and were reassembled by Fiat in Torino and were model 583H. In 1984 the remaining 19 two-seater were supplemented by 6 ex German Air Force aircraft. From 1997 onwards 15 TF-104G have been converted to TF-104G-M (M for "Modificato") standard. MM54254 "4-36" served as the prototype. The dual "M" differs from the F-104S/ASA/ASA-M in that, for instance, it lacks the satellite navigation system (GPS). When the required aircraft have been converted, the remaining TF-104G were gradually withdrawn from use. The exception to this rule was MM54233 "4-30", which remained in service as a G model (with RSV). 20°Gruppo became part of 4°Stormo (same airbase) in 1985. Before that the 20°Gruppo was autonomous. After 1985 the numbers became higher than 24 not to be confused with the lower ones owned by the 9°Gruppo, until that date the only squadron of 4°Stormo. Given information is based on best available references, any proven correction is welcome!